No, not that Lagos! 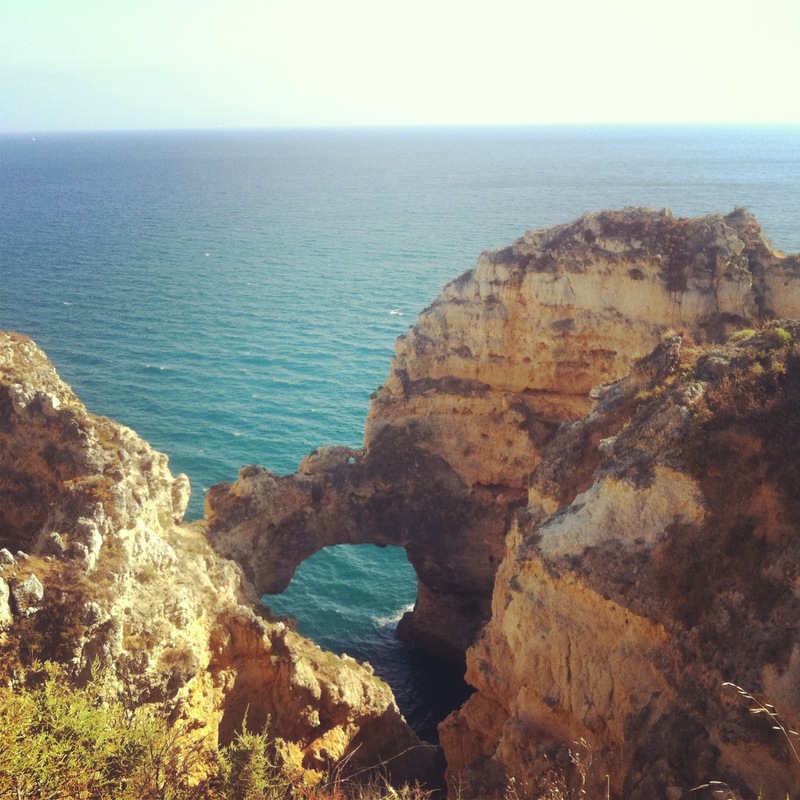 I’m talking about Lagos, Portugal, a small, buzzing beach town on the Algarve coast that completely won me over with its pristine beaches, friendly locals and easy going charm. 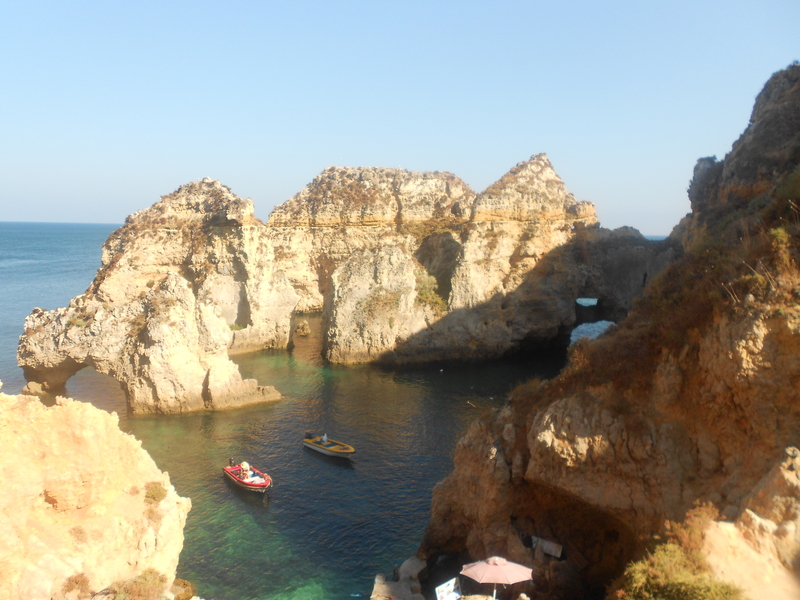 Filled with backpackers (predominantly Australian – it felt like half of Australia had upped sticks and moved to Portugal – if you’re an Aussie reading this, please enlighten me – is Lagos some kind of Australian mecca?) and drenched in sun it has a much more chilled out vibe than Lisbon. 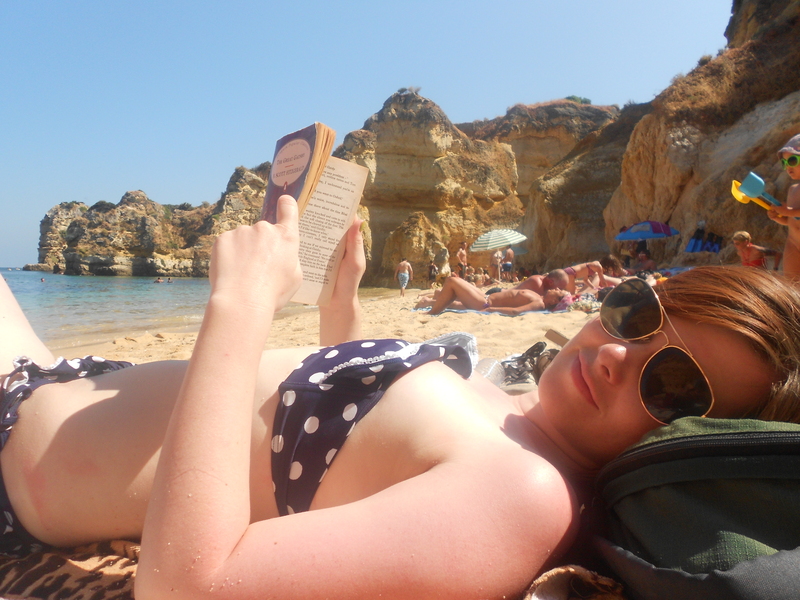 After spending several days in the hectic Portuguese capital, I needed some down-time. And for the first time in over a year I found myself by the sea again. I’m not a beach potato. I’m pale, I burn easily and I freckle so much that if you managed to complete a game of dot to dot on my face, you’d be the world champion. Beaches and me don’t mix. Full stop. When I was a child you’d find me curled up under an umbrella, inseparable from the shade, hating the prickly, rough gold ground with the kind of hate that only a ten-year girl can muster, leaving my beach-worshipping parents confused and exasperated. I’d like to think I’ve since come to terms with beaches, but even now, at heart, I’m a city-break kind of girl. But Lagos’ beaches made me forget all about that. First there’s Batata Beach. A sandy little cove a stone’s throw away from the town, where hungover backpackers chattering about last night’s escapades sunbathe next to perma-tanned and speedo-clad locals. It’s not what you’d expect from a party beach – it’s clean, relaxed and pretty, but not a patch on the beaches a little further down the coast. 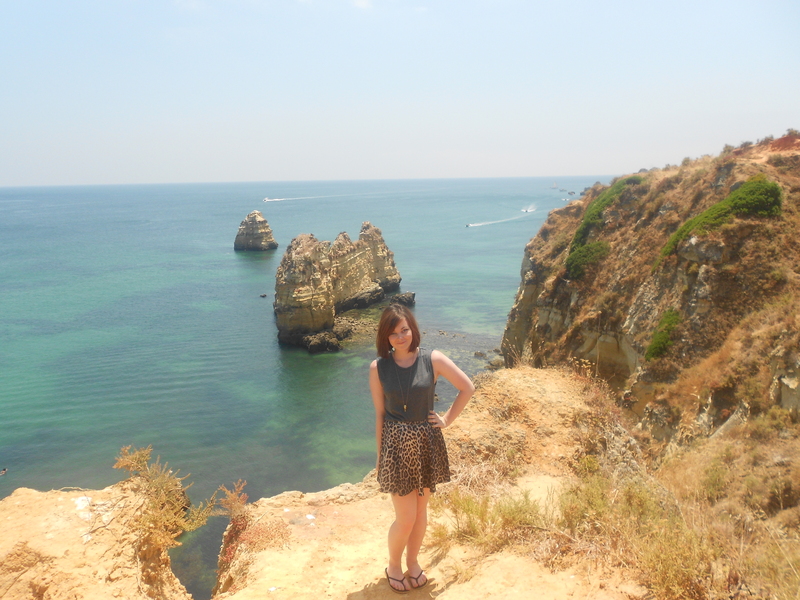 A fifteen minute walk brings you to the sensational Praia Dona Ana formations. Rocky outcrops jut out of an inviting sea, twisting out of the water into unusual and alluring bridges and towers. If you’re a strong swimmer you can head out and swim underneath them. 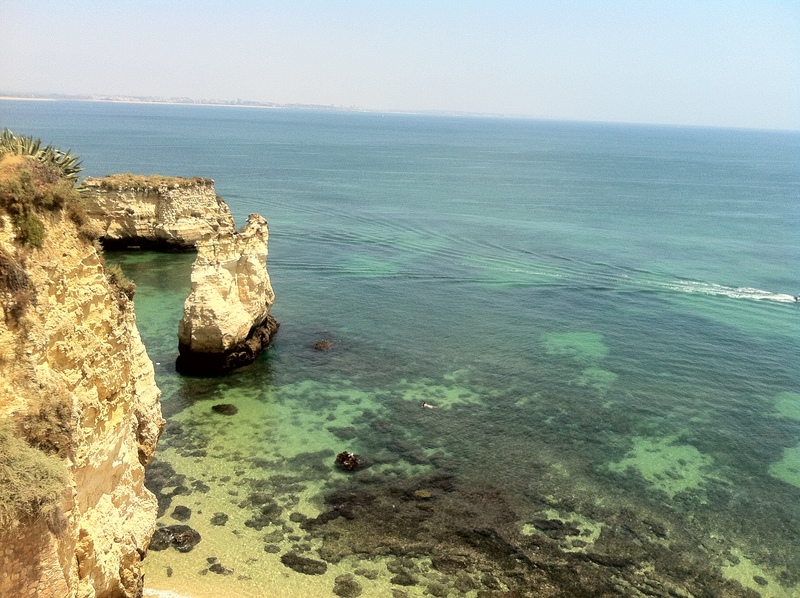 Keep going and you’ll reach the furthermost of Lagos, the lighthouse, and next to it, the craggy, weathered and spell-binding grottos of Ponta da Piedade. Locals hanging around at the tiny dock here offer the chance to take a boat out to explore the caves up close for €12 per person, or if you’re more physically inclined you can take a sea kayak over from Batata Beach. But it was Camilo Beach that won me over most. Tucked away in a pocket of weathered cliffs is this little gem of a beach. A scenic 40 minute walk from the town centre, you have to climb down hundreds of steps to reach it, but boy is it worth it. It’s the perfect place to sit down with a book (The Great Gatsby if you were wondering) and just forget about the world. The beaches here are only the second I’ve been to where the colours and views are every bit as vivid and enticing as the pictures in the guidebooks. Unfortunately reality (and years of beach resentment) came back to bite me when the yellow parts of my tattoo suffered an allergic reaction to the sunlight. (Yellow ink swells up when exposed to strong sunlight, who’d have thought it?) While having a temporary 3D effect of a tattoo was kind of cool, it’s not something I’d like to experience again. Now, onto a matter close to my heart – food. Lagos is home to one of the top 50 burger joints in the world. Loving a burger I knew I had to investigate and set out to fill my stomach at the well loved Nah Nah Bar. The kitchen serves up face-sized, sauce-laden, succulent and filthily named burgers – Blue Ball Buster anyone? 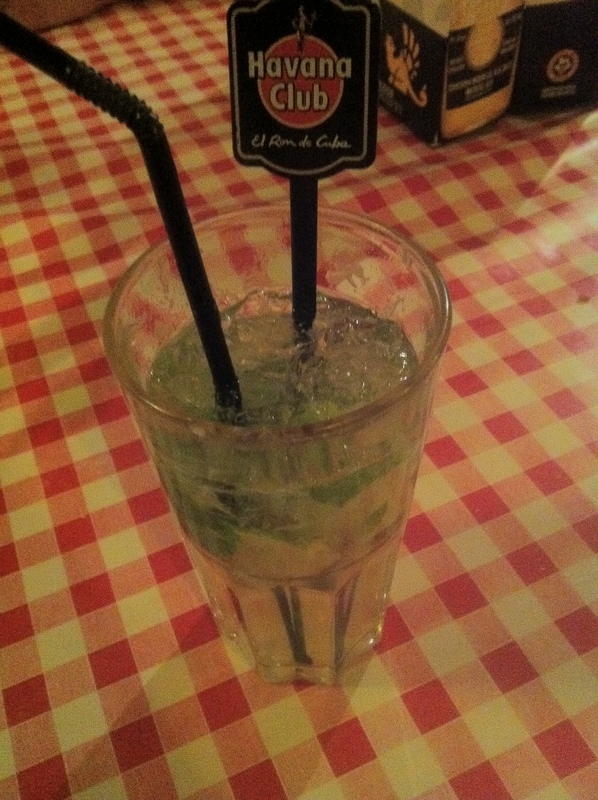 I thoroughly enjoyed every meaty scrap of mine, and washed it down with the best Mojito I’ve ever had the pleasure to pour down my gullet. It’s not especially cheap, but it’s damn tasty. Another place worth visiting is the rather nondescript looking Cafe Odeon, which serves the best fry ups outside Blighty. The cheap milkshakes, €3 all-day breakfast and homely atmosphere has made it a firm favourite with backpackers and an unbeatable location for dealing with a hangover. Before I go any further, I want to set one thing straight: Lagos isn’t the kind of place you go for a cultural experience. You won’t find any UNESCO World Heritage sites or works of artistic or architectural genius here, and you’re more likely to be served by a Euro-tripping Aussie at the bar than a local – but it is perfect for relaxing on the gorgeous beaches (and they really are beautiful) enjoying a refreshing dip in the clean, clear ocean and taking advantage of the numerous cheap bars (A bottle of wine sells for as little as €1 – I’m not kidding you). If it’s a good, old fashioned, unsophisticated time you’re after, Lagos is your town. With prices like that it’s not hard to see how it’s become a pit-stop for those backpacking around the region. For adventurous types, there’s the chance to get to grips with surfing, sea kayak over to the caves and grottos or head out on a dolphin watching tour. For those with a more booze-filled break in mind, the infamous Lagos booze cruise awaits. Despite all my talk of cheap alcohol, booze cruises and partying, Lagos isn’t just another Malia or Magaluf. It’s not trashy, seedy or overrun with drunken teenagers. That said, it’s not a remote, undiscovered location dripping in historical and cultural relics either. But for anyone looking for a fun time in a phenomenal location, you can’t go far wrong. But don’t take my word for it – head out to Lagos and experience it for yourself. Would I visit Lagos again? Most definitely. 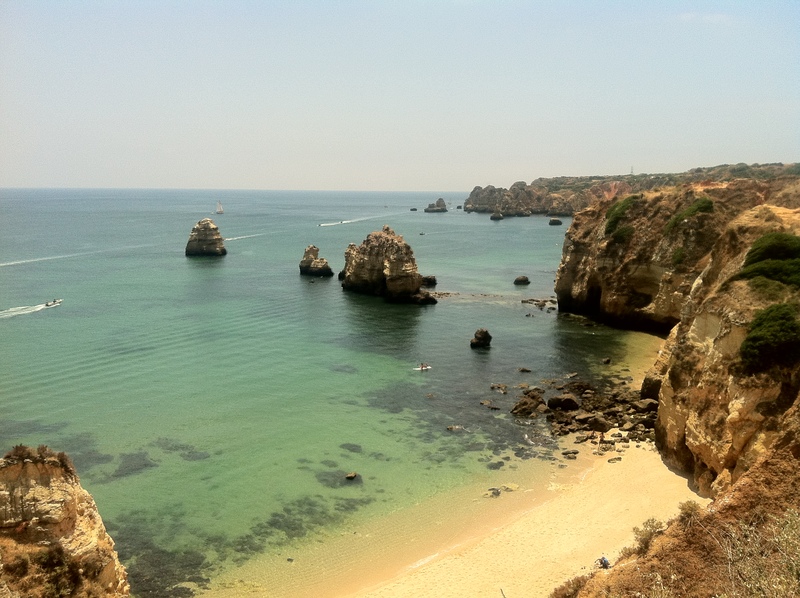 It’s a great value beach destination (cheaper, less snobby and with fewer package holidayers than most of the Algarve) for anyone travelling around Portugal, or for someone who fancies a cheap break in the sun. Flights from the UK into nearby Faro airport are available for as little as £30 each way with Ryanair. It’s then just a quick 2 hour train ride from Faro to Lagos. (Costing €7.20 one way) Alternatively, you can catch a comfortable, air-conditioned bus from Lisbon to Lagos (Journey time is around 4 hours) for as little as €18.50. WARNING: If you come to Lagos, you may never leave. Have you ever been to Lagos? Did you enjoy it? Tags: Europe, Portugal. Bookmark the permalink. uhhh I’m so excited 🙂 I’m going to be there in Portugal and I already know that it will be tooooooo less time. hope to go kayaking and to the caves. yes i was there 2years and i love the place why i looking there a wife too can there back from poland again and marry there,marcin.